Meet The Man in the Black Shirt. 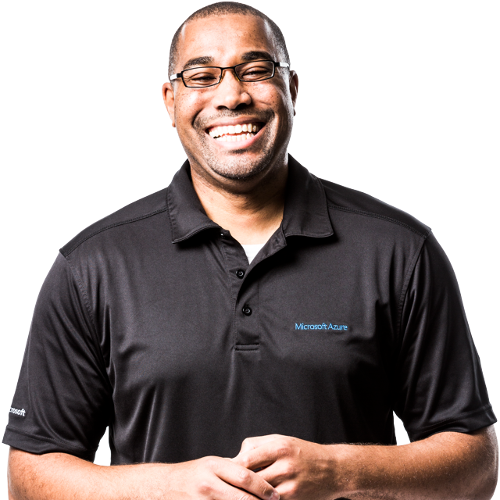 Donovan Brown is a Principal DevOps Manager on Microsoft’s Cloud Developer Advocacy team. Why is DevOps one of the hottest topics? Because it hurts the most. Luckily, Donovan’s unofficial tagline is #RubDevOpsOnIt and he’s here to make it all better. Before joining Microsoft, Donovan spent seven years as a Process Consultant and a Certified Scrum Master. Developer Tools are his thing. Donovan has traveled the globe helping companies in the U.S., Canada, India, Germany, and the UK develop solutions using agile practices, Visual Studio, and Team Foundation Server in industries as broad as Communications, Health Care, Energy, and Financial Services. What else keeps the wheels spinning on The Man in The Black Shirt? Donovan’s also an avid programmer, often finding ways to integrate software into his other hobbies and activities, one of which is Professional Air Hockey where he was ranked as high as 11 in the world.